Aw, muffins. "Aw," like your mother saying, "But she's such a good-hearted girl, so what if she wears jeans with elastic at the waist AND at the cuffs?" Note: your mother was not referring to me. I refused to wear denim altogether in favor of bright monotone sweat pants with preemptive patches sewn in the knees. Black cherry oat muffins are bumbling and nubbly, attempting to hide their dark hearty wholegraininess under the guise of black cherries and molasses. Like when elastic-jean wearers grow up to be adolescent Mennonite girls hiding their pimples and purity under white powders and black lipstick. Whisk together 2 cups whole-wheat flour, 1.5 tsp. salt, 2 tsp. baking soda, 2 cups rolled oats, and 1 cup quick oats. Or whatever combination you prefer. In another bowl, whisk 2 eggs, 1/2 c. brown sugar, 1/4 c. molasses, 2.5 c. buttermilk, whey, or yogurt, 1 tsp. vanilla, and 1/4 tsp. almond extract. Let the batter sit and thicken up -- all afternoon, or overnight, or till next Sunday -- while you preheat the oven to 350 and butter and flour 18 muffin holes. Just before you put them in the oven, add 2 cups halved frozen cherries. The cherries melt and form warm dark caves. Bake till they have risen and a knife inserted in the middle doesn't come out gluey -- 20-25 minutes or so. Actually, the cherries are entirely arbitrary. I just happened to have them on hand from Valentine's Day, and frankly think blackberries would work much better. 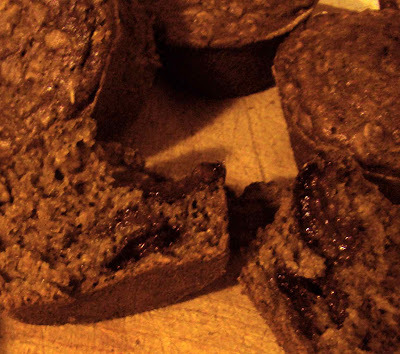 This recipe (my bran-less adaptation of a bran muffin recipe) turns out to be very similar to an old one my mother just sent me; which, when my kitchen is back up to muffin-production standards, I'll try for comparison. Wish I had such a muffin now. The tea at the tea house where I have come to fetch the Internet is very fine indeed, but the scone tastes like baking powder. Hmph.